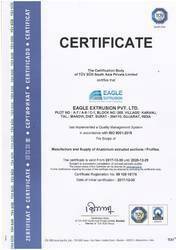 Known for the purpose of manufacturing and supplying the best quality of Hardware and Architectural Utilities, Eagle Extrusion Pvt. Ltd. was established in the year 2008. Inclusive of Architectural Components, General Miscellaneous Profiles and Aluminium Section, we offer a wide range of products. Cutting-edge machinery, equipment and tools are used for the purpose of manufacturing the offered hardware and architectural utilities. Manufactured as per the industry laid norms, the offered hardware and architectural utilities, are used in various construction industries. As per the specifications provided by the patrons, the offered hardware and architectural utilities can be customized at our end. Dimensional accuracy, high tensile strength, impact resistance and longer serving life, makes these hardware and architectural utilities highly demanded in the market. Large production capable infrastructure and skilled workforce, has helped us in catering to the precise requirements of the ever-changing market trends. The optimum quality of the offered construction products is our utmost priority and it is never compromised at our end. Wide distribution network has helped us in delivering the offered hardware and architectural utilities at the patrons’ end. Under the supervision of Mr. Bharat Meruliya (Managing Director), we have been able to attain a commendable position in this domain. He has helped us in attaining the trust of our patrons by following ethical business polices and customer centric approach. Manufacturing,Trading, Importer and Exporter of a wide range of Hardware and Architectural Utilities. Established at Surat, our infrastructure is well-equipped with latest machinery and equipment that are required for carrying out standardized production. Our infrastructure is carefully segregated into different units, to ensure that all the on-going processes are carried out in the most streamlined manner. Our biggest strength is a pool of experienced and hard working professionals who hold expertise in their area of work owing our profound experience. Furthermore, our professionals are trained through seminars and workshops, to enhance and polish their skills in the most efficient manner. By meeting the bulk assignments at cost effective prices and within the assured time frame, we have been able to make a long lasting association with our patrons. To attain maximum customer approval, we work in close proximity with our patrons and follow ethical business polices.